Well the weather is changing and providing some great fishing. The lakes are still full of food and keep returning great results. Mudeyes are starting to really pick up and the bait fishing is great. 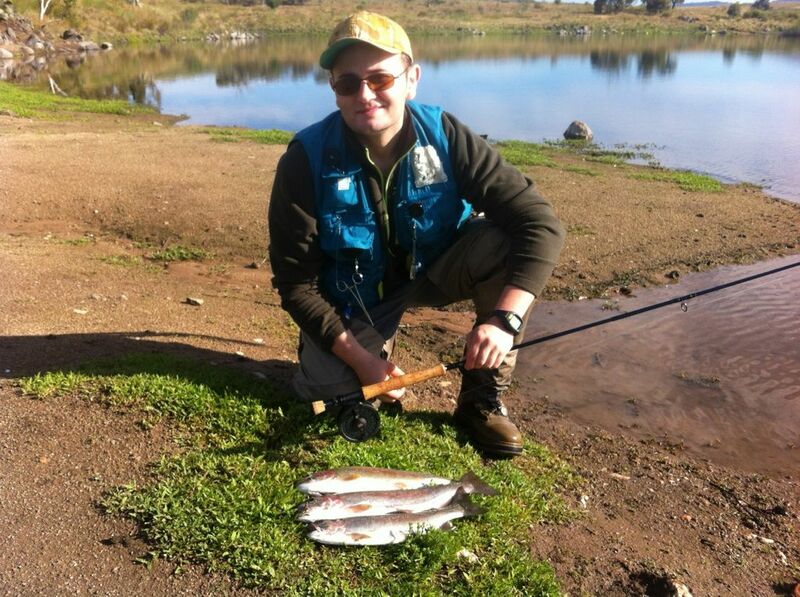 A sellection of some of the many beautiful trout caught in the thredbo after christmas. the river is in great condition and fishing well. Caught this lovely brown trout on the Thredbo river last Thursday, 1km upstream from Diggings Campsite on a Gold Ribbed Hair’s Ear dropper.Had excellent fishing with six trout (3 brown, 3 rainbow) up to 2lbs over two days on both dry fly and and nymph. 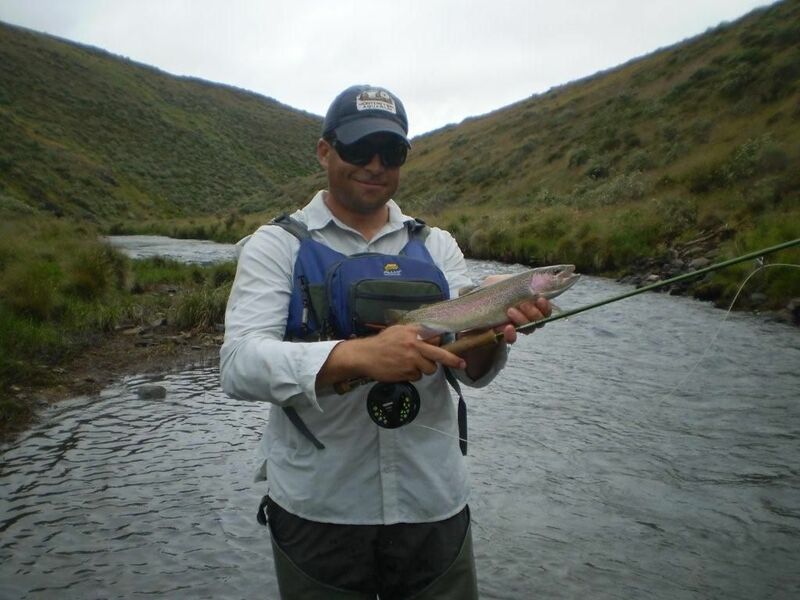 Here is Peter Vierod fish on the river. Thanks again for helping me get the fish from last week to skins alive! 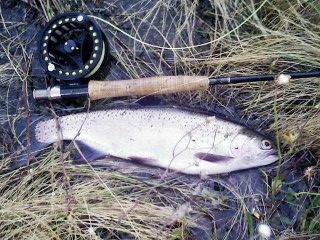 Had another good night on New Years Eve caught around 10 for the evening with a couple of nice rainbows (biggest bow 42cm). 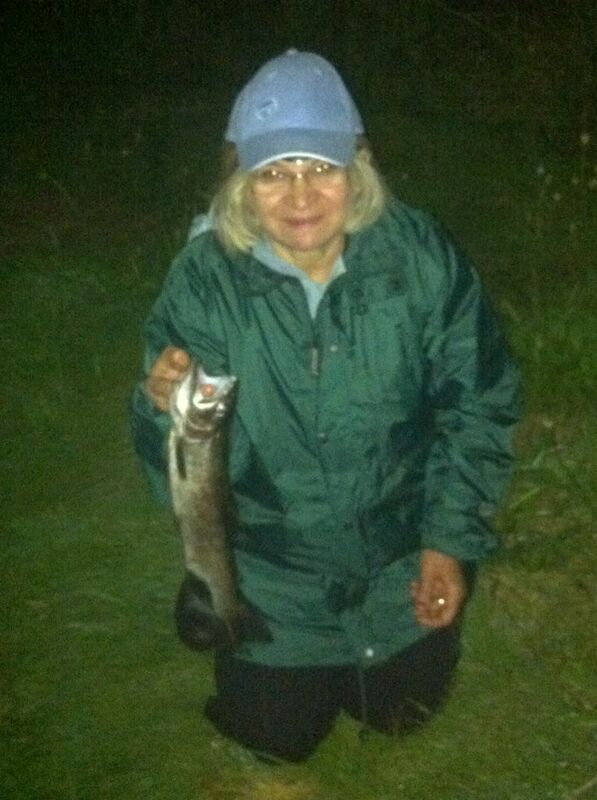 Got another good brownie after dark that I had heard rising in a lesser fished soak on the way back to the car. She went 56cm (Yellow Stimulator again) and 4 ¾ Lb (2.15Kg), she tried to wrap me around the thistles at my feet shortly after hook up but, I managed to get behind her and chuck her up the bank! No landing net used just Man Vs Fish for me when landing these big ones. Tons of food on top again xmas beetles, midge and even a few mudeyes starting to hatch! Guessing you could open that zip I sent through with the other pics last week! I’ve attached a few of those pics from the big one 7.5lb 68cm I got last week and the new years eve pics not previously sent. I hopefully be back down on Australia Day Long Weekend the hoppers should be on big time by then and the mudeyes should be going well after dark! These are some great fish Mark well done good to see if we persist you can come up with the goods. Just a quick one seeing there have been no current reports provided on Tantangara. Fished there with a group for the last couple of days of Dec. With water levels dropping and mild water temps, the fishing was overall very quiet. A few small rainbows were picked up trolling and on power bait. The couple we did keep were chocka block with beetles and yabbies. 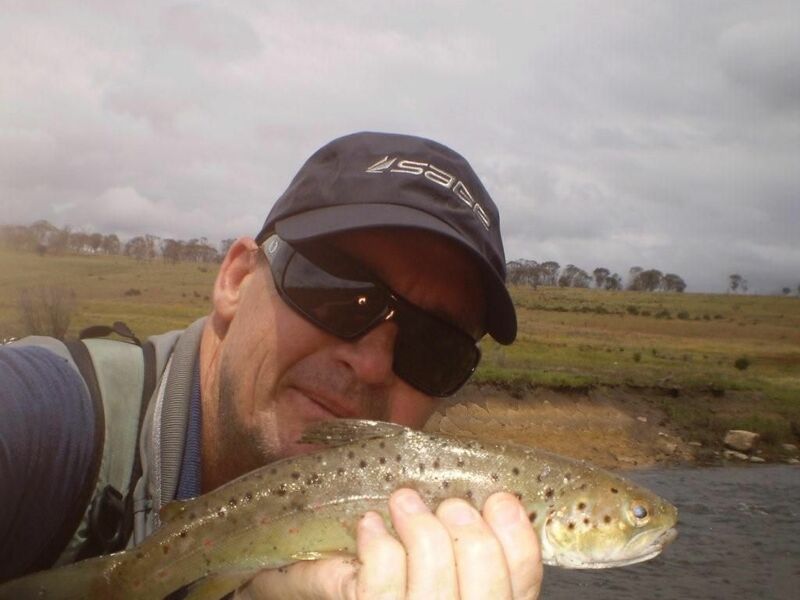 A couple of browns were enticed in the upper Murrumbidgee above the lake – on spinners and flies. Persistence was the key! One of those sessions where you could relax a bit more and take stock of the fact that you aren’t at work!! No doubt the best is yet to come. Fished from the Buckenderra Holiday Village heading south towards Middlingbank. Couldn’t raise any on wets (tom jones & wooly buggers) during Saturday afternoon. However, a couple of hours before dark the fish started on top and didn’t stop. Fish caught were all pan sized rainbows with plenty of go in them. I was fishing a Humpy with yellow body to start with and then a mudulid after dark. Got back on the water before first light in the morning and the rainbows were still mopping up. I concentrated on trying to locate a big brown cruising the edges in close. No luck in close, so put a tom jones on and cast out. This provided another 2 rainbows in the same size bracket. Photo attached of the fish I kept, and released 9 others. The fish had a diet of midge, beetles and a yabby. Photos quality/size aren’t great as they are taken from my phone. I had a great time and am looking forward to getting back up sooner rather than later. 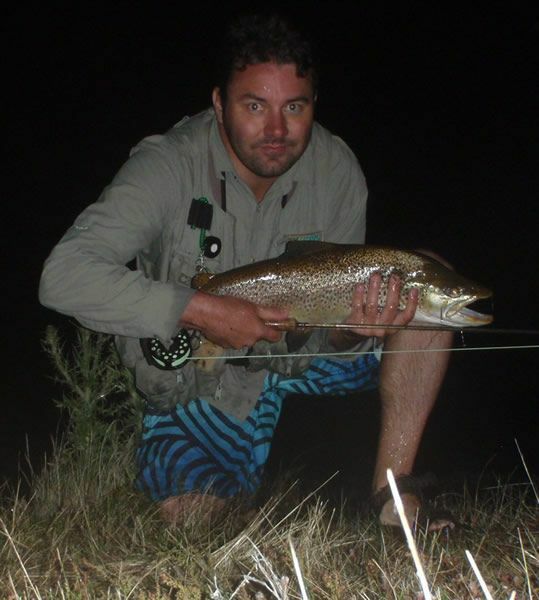 Fishing at Buckenderra has been awesome especially fly.. midge balls and Bills yabbie having been doing very well in the shallows and of a night Ben’s mudeye, Mrs Simpson and red/black fuzzy wuzzy are exceptional the fish are around 800gm and in excellent condition. Trolling the yellow wings seem to catch a lot in the early morning and Tassie devils with reds done well later in the day. They are catching them in the new smaller arms that are appearing with the water rising. With spinning it has been successful with the 4gm Lofty’s and the vibration lures.. gold in colour, powerbait at the moment it has been charteuse and sherbert that have been catching a lot of rainbows. No matter what you are using the fish are taking it. So we hope to see you soon. Here we have a great report from Joe and his family. 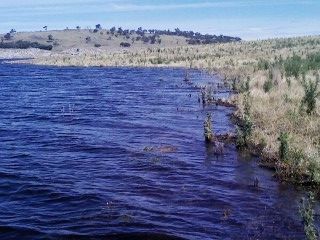 Fished lake Jindabyne and the Snowy region from the 24th Dec till the new year, with my dad and mum. In all up we caught 9 fish, the fish were in the proximity of 750g - 1.75kg, 7 rainbows and 2 browns at dusk. Released two under size rainbows. And lost 3 trout due to the weed beds (i.e. two of the fish big were big and the one i lost on fly took me to my backing, never seen or experienced such an event, using an 8weight outfit), two on fly and one on F5 rapala brown trout. Lost another 5 or 6 on failed hook ups (the lures were Blue fox yellow/ orange spinner , Halco golden wobbler, craig night time and green mudeye patterns). The fish on the lake were caught at first light, some at 8-9am on the cooler mornings and dusk or at night. On the river night time, never fished first light but around early morning the fish were very spooky, but plenty if u don't spook them. The fish were full of nymphs and pre dominantly mudeyes in the stomach contents. The thredbo river browny, also had a substantial amount of black beetles and mudeyes (i.e. 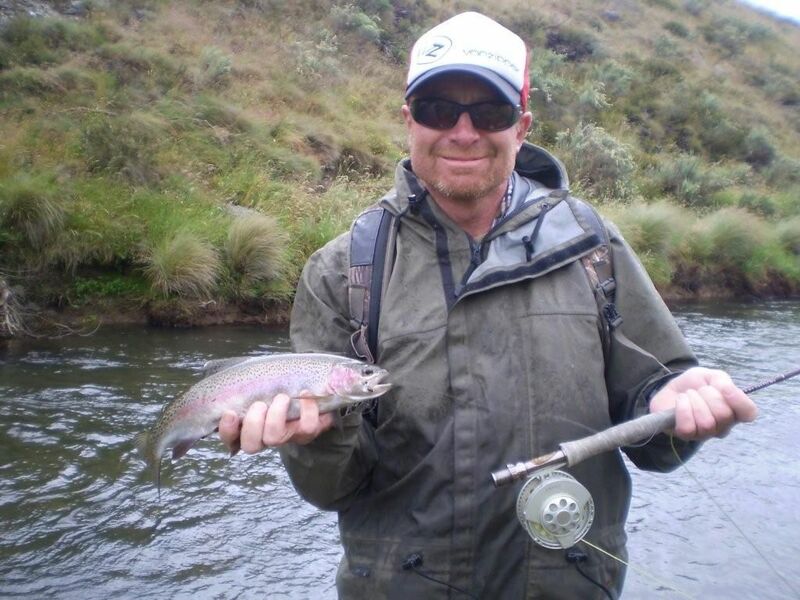 red tag replicate fly), while the rainbow was long and skinny and looked all out of condition, maybe a very very late spawner or hatchery fish. The fishing was sensational, until the traffic came along and the water skiers and jet skiers, the next few days it was tough going guys. The trout hid in deeper waters and well away from the noise. The big rainbow my dad (ie Michael Hristovski) caught was on a F5 rainbow rapala pattern. The Rainbow my mum (Nada Hristovska) caught on the Thredbo river was on a green pumpkin Berkley cricket (mudeye). She also did catch the lager brown i am holding on the Jindy photos, on a little lofty frog pattern on a single hook, to my amazement. Also Mick and the boys enjoying a lazy afternoon on the Eucumbene river.